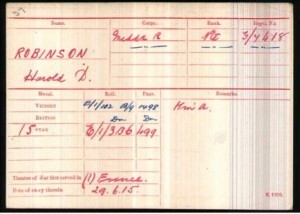 Lance Corporal Harold Donovan Robinson. Dorking Soldier. 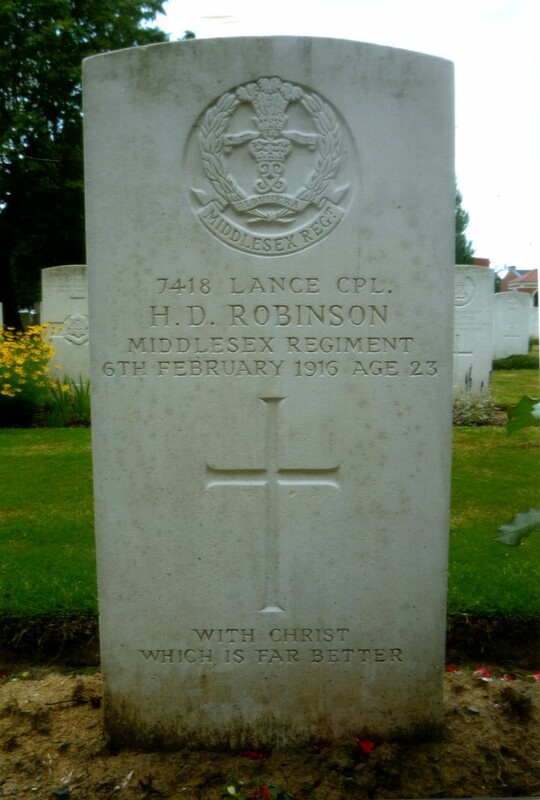 Harold Donovan Robinson was born in the first quarter of 1893 in Dorking and was baptised on the 30th of April 1893 at St John in North Holmwood. 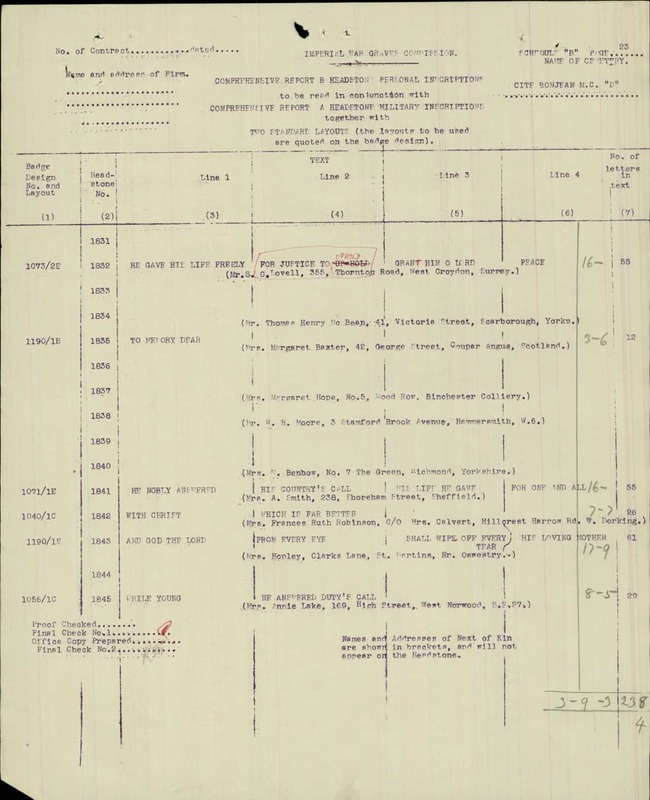 His parents were called Henry George Robinson and Frances Ruth Robinson (nee Welsh). 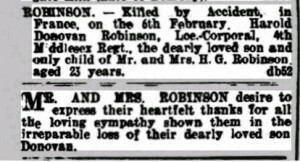 Henry George Robinson was born in 1850 in Esher, Surrey and worked as a plumber. Henry’s parents and Harold’s grandparents were painter Joseph Robinson and his wife Ann. Frances Ruth Welsh was born in 1873 in Bushey, Watford in Hertfordshire. Her father and Harold’s maternal grandfather was called Joseph Welsh. The couple married on the 28th of September 1891 in Elstree, Hertfordshire. The bride being over 20 years the groom’s junior. 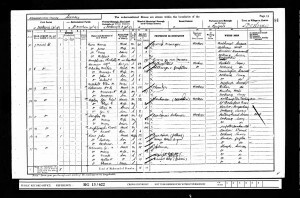 At the time of the 1901 Census, Henry, Frances and their only child, 7 year old Harold, lived at Mount Street in Dorking. Henry was working as a plumber. 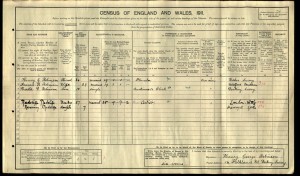 During the 1911 Census, the family moved to 14 Falkland Road in Dorking. Henry was still working as a plumber and the eighteen year old Harold, as an auctioneer’s clerk. The family had also boarders: an artist and his seven year old daughter. The house had six rooms. Before enlisting, Harold worked for many years with Messrs. F. Arnold and Son auctioneers and house agents. He was a member of the Congregational Church and active participant in many institutions connected with it. Harold was said to be a manly young man with upright character. 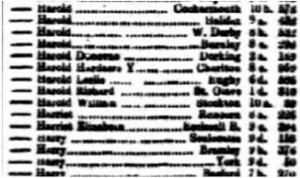 Harold enrolled into the 4th Battalion Duke of Cambridge’s Own (Middlesex) Regiment on the 12th of January 1915 in Guildford. At the time of his enlistment and death he was living with his parents at 14 Falkland Road in Dorking. His regimental number was G/7418. He became a Lance Corporal. 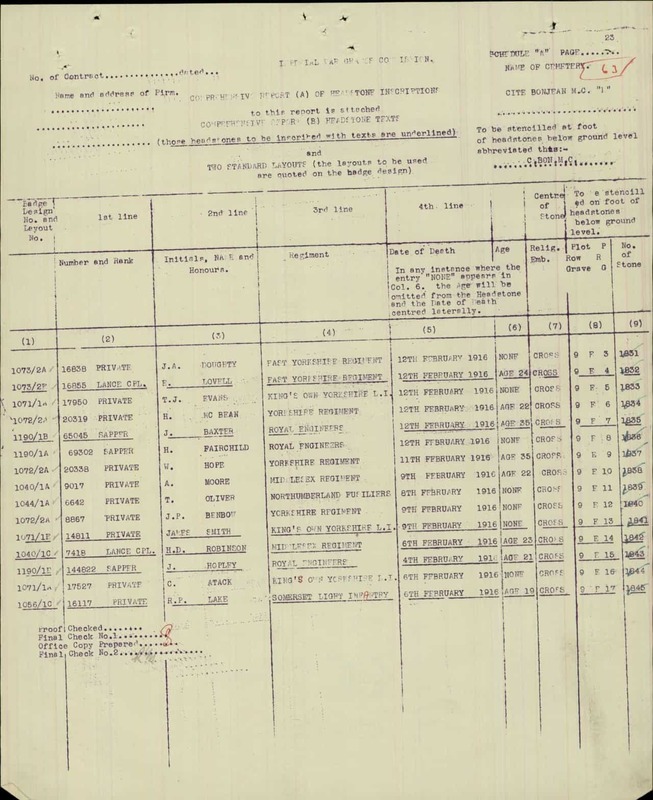 He disembarked to France on the 29th of June 1915. 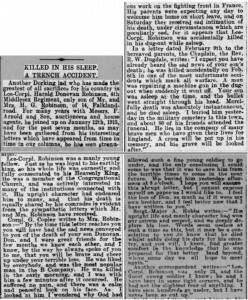 Harold was killed by an accident in the early morning of the 6th of February 1916 in France. He was killed in his dug-out while asleep. Sadly, his parents were expecting him on a short leave at home. 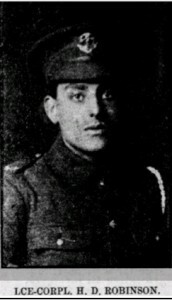 According to his comrades Harold was liked by everybody and was the most popular man in the B Company. 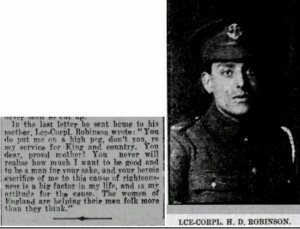 His Soldiers Effects of £5, 12s, 2d and £3, 10s were given on the 30th of May 1916 and the 26th of August 1919 to his mother Frances Ruth Robinson. 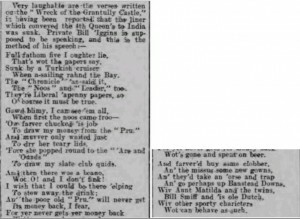 His mother also received £116, 8s and 5d in the Probate. Harold received the British War and Victory medals and the 1915 Star. After the war his mother moved to Hillcrest, Harrow Road West in Dorking. 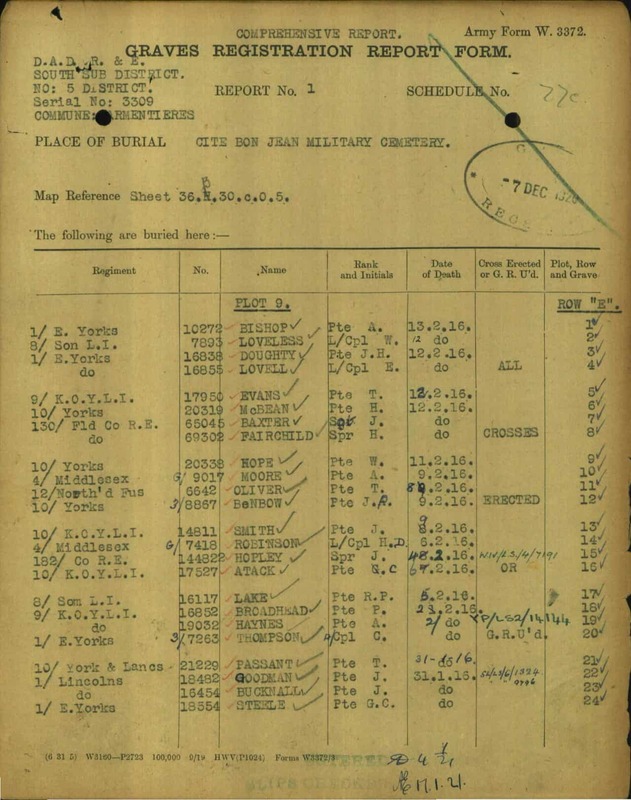 He is buried at the Cite Bonjean Military Cemetery in Armentieres, France. His grave reference number is IX.E.14. His headstone reads: “With Christ Which Is Far Better”.